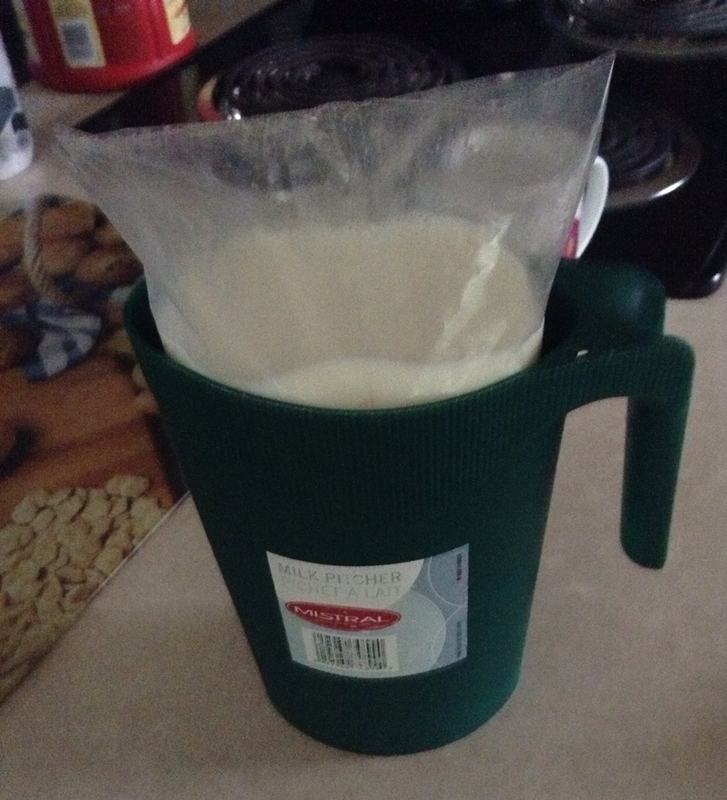 People who live in Ontario drink milk out of a bag. Ontario has saved tons of money by not painting white lines at the edge of many of its roads. There are some white lines, but not lots of them. Not having a line makes it easy to accidentally steer off onto the rocky shoulder when trying to fix one's eyes on something other than where one's front tire is about to roll. People in Ontario haven't shared friendly waves as much as people in the U.S. In fact, it seems as though a disproportionate number of Canadians have given me an eww-you-are-a-bum-on-a-bike-stay-away-from-me glare. I'm really surprised by this. I haven't noticed this before with Candians. Then again, I'd only ever biked in British Columbia before this trip. People aren't terribly great at giving directions. It's a lot of hand waving, but not a lot of exactitude. There was certainly no use of north, south, east, or west. One of the ways to know that you are approaching a town is by seeing a reduction in speed limits. It's really weird to see the speed reduced from 80 to 50 when nearing a town. This is in kilometers, of course. But, my silly brain just couldn't register that 50 was slow enough for traveling through a town. I'm really surprised to find myself saying this, but I'm glad to be back in the states. Like, really glad. travelling through Ontario wasnt exactly as stellar as I thought it woukd be. 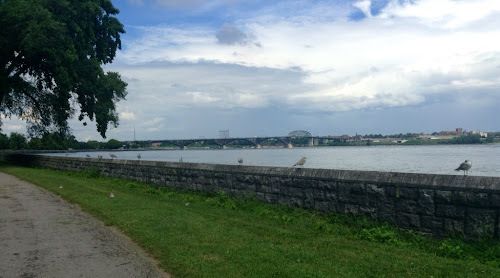 I was surprised how excited I was to see the Buffalo skyline when I turned the corner on the Friendship Trail this afternoon. Then again, maybe I was excited because I saw the end to my 80-mile day. Today I won some. And I lost some. We all know that the shortest distance between two points is a straight line. In an effort to minimize miles, I went off-route and spent a good part of a map panel sticking straight to Route 3, instead of weaving back-and-forth on slightly more bike-friendly roads. This saved some miles. And so this is the part I won. In a kerfuffle of bad directions leading out of Dunnville, I managed to get myself on the wrong route 3. This is the part I lost. How dumb is it to have two "3's" leading out of town? On my map, the 3 I wanted has a white box around it. But, there's another 3 on my map with a maple leaf around it. That's not the route I wanted; I ended up on the maple leaf when I should have been on the box. For the record, the road signs have a crown for one of the 3's and an upside triangle for the other 3. I guess mapleleaf = crown and box = triangle. Maybe its entirely obvious to the rest of you. In the end, I biked the same number of miles that my map told me I would have biked had I stayed on the route. Net mileage savings = 0. The route today was more curvy - both vertically and horizontally. Woohoo! I've concluded that the tiring thing about biking flat routes is that I am constantly pedaling. And at the same pace. At least vertical curves allow for the option to coast and to change the pace of the pedal rotations. I rode through the village of Selkirk today. "Selkirk" has a special place in my heart, as my first multi-day self-contained bike tour was in the Selkirk Mountains. But those dear-yet-not-near mountains were in British Columbia; not in Ontario. 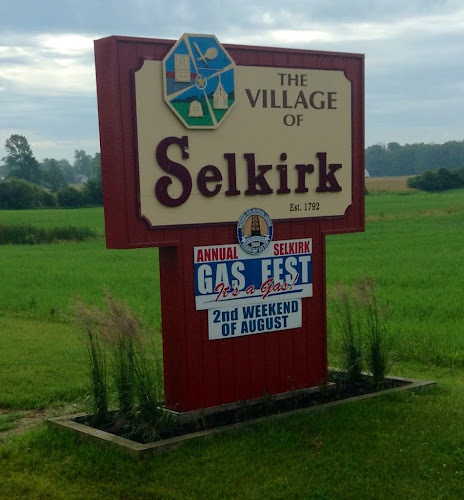 I'm not sure I'm a fan of a "Selkirk" that is the home of an Annual Gas Fest. Sounds tacky. And smelly, too. 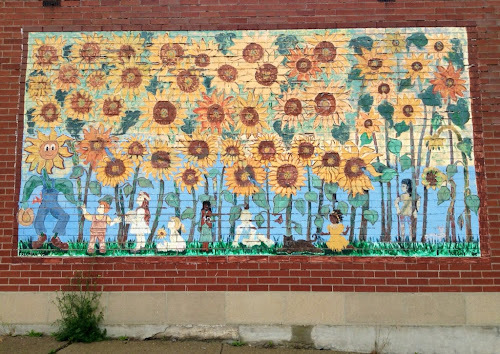 This Selkirk redeemed itself with its lovely mural. 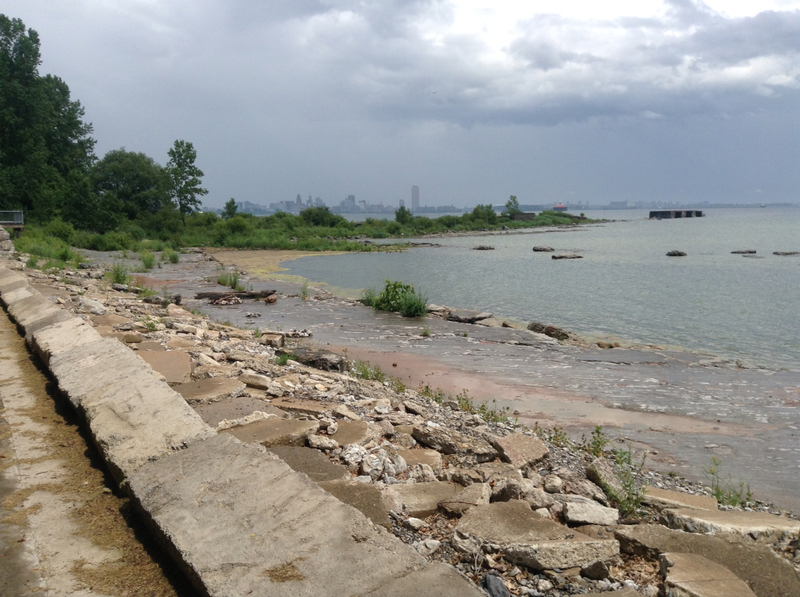 I rode about 20 miles of The Friendship Trail today, which extends from Port Colborne, ON to Fort Erie, ON. There were lots of garbage cans and benches along the trail. But not a single restroom or water fountain. What's the deal with that? The trail went along the Historic Fort Erie. I rode up to the entrance thinking, "I'll probably only be here once. I should see the fort." But then I thought, "Nay, it doesn't interest me." I am working on doing a better job of banishing the "shoulds" from my life. Occasionally, I have silly slips like this one. I've found on this trip that I have no interest in the historic sites that I pass. Visiting Uncle Tom's Cabin the other day was not interesting to me. It added no value to my trip. And that's okay. I've also decided that cutesy little touristy towns don't interest me either. After awhile, they all start to look the same. Plus, as a minimalist, witnessing all the wasteful consumerism gets me down. So, although I had a number of recommendations that I take a detour to visit the town of Niagara on the Lake tomorrow, I've decided that it isn't something that would likely interest me. Forget the history and the towns. I'm itching to get back to the forests - preferably more mountainous ones. Bring on the Adirondacks! 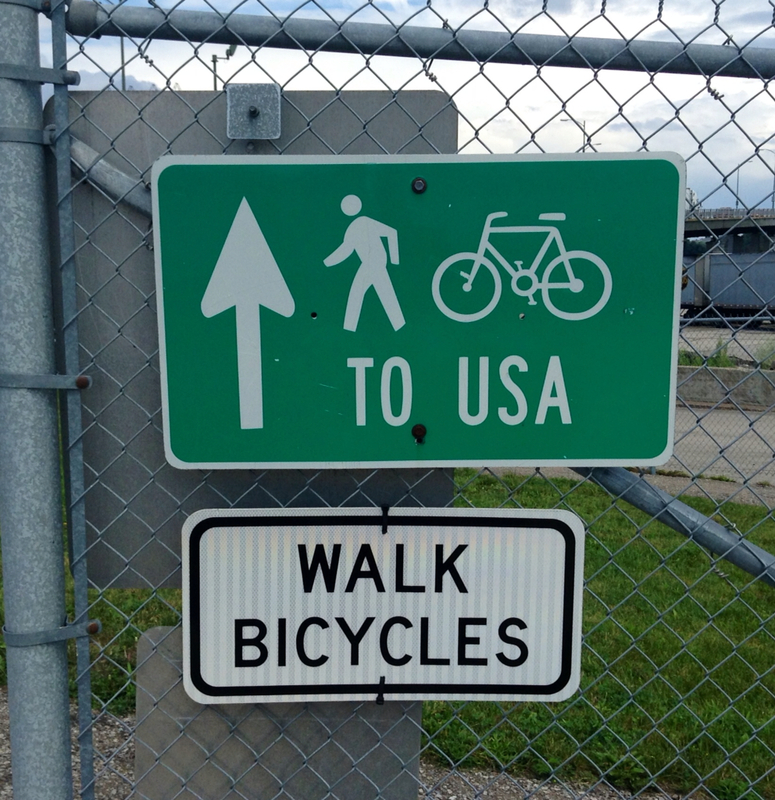 As mentioned earlier, I crossed back into the United States today. The crossing was via The Peace Bridge, between Fort Erie and Buffalo. The Peace Bridge, from a distance. 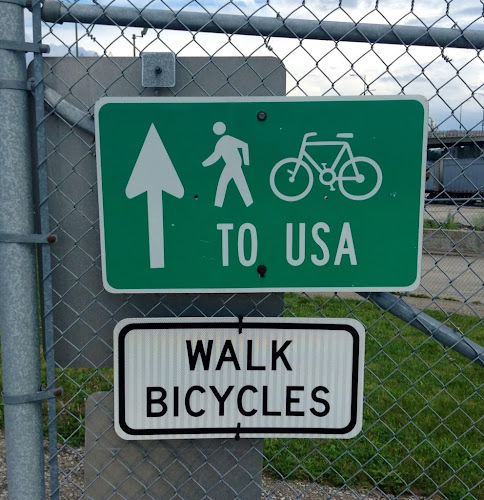 The signs indicated that bikes should be walked across the bridge to the US. 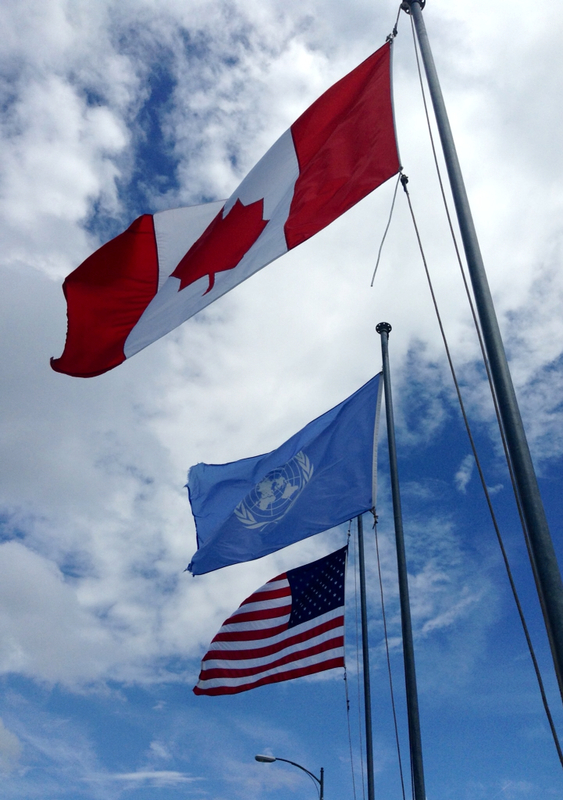 These flags fly just about the international boundary. 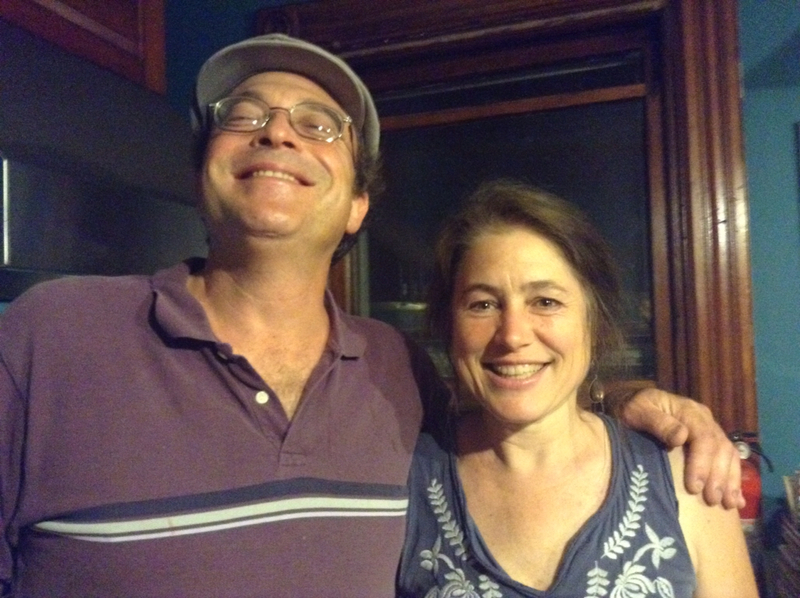 My Warm Showers hosts for the night, Cliff and Carol, live just a few blocks away from the Peace Bridge. I've never been to Buffalo before, and so I expected the city to have all the hustle'n'bustle of a mini New York City; I expected the streets to be full on honking cabs and people running from place-to-place. That was not the case. At all. There was no chaos. And there were even bicycle lanes! I knew I was at the right place when I saw this bike rack out front. Cliff and Carol are awesome people. Cliff's main gig is real estate, but he has a side business called "Teen Treks." Teen Treks offers self-contained bike trips for teens in the US, Canada, and Europe. As I've toyed around with the idea of offering my own tours at some point in time, I really enjoyed talking with Cliff about his business. Carol made a fantastic dinner. We enjoyed the meal sitting out on the deck. Cliff gave me a heads-up that the dinner was "worth waiting for" (we didn't start eating until after 9pm), and boy was he right! Delicious! Carol, you are an amazing cook! Cliff and Carol have a great set-up for hosting cyclists. 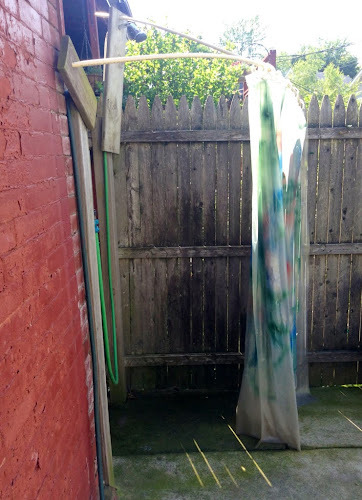 There is plenty of room for tents in the backyard, there is a separate bathroom, and there is an outdoor shower. I asked Cliff how the shower worked: "Is this a wear-a-bathing-suit-kinda-thing?" Nah, no one is looking. How liberating to shower outdoors! In the middle of the city of Buffalo! I passed the 2,000 mile mark today. That seems like a lot of miles. Then again, I commuted 2,000 miles by bike in my 4-month stint at my job last summer, riding 20 miles round-trip each day. That makes my 2,000 mile trip not seem all that far. One thing is for sure, though. I've seen a heck of a lot more and had a heck of a lot more wonderful experiences in the 2,000 miles traveled on this trip. This is Dereka-- we met in Harbor Springs. John and I drove through Ontario when we were on our way to Michigan and we stayed at a motel in Donnville. A woman there warned us about the two route "3"s so we got it right. 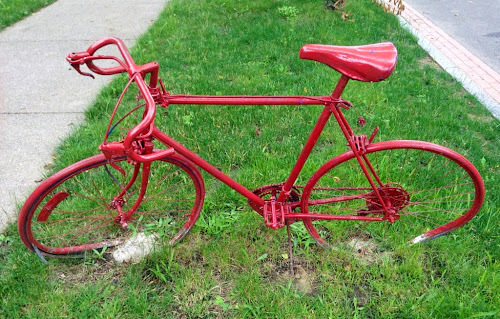 It looked like good biking. Hi Dereka! Glad you got the two route 3s correct. The route 3 I was looking for happened to be called Main St in town. I asked two or three people (all locals) and none of them had heard of Main St. Oh well, I guess it's all part of the adventure!